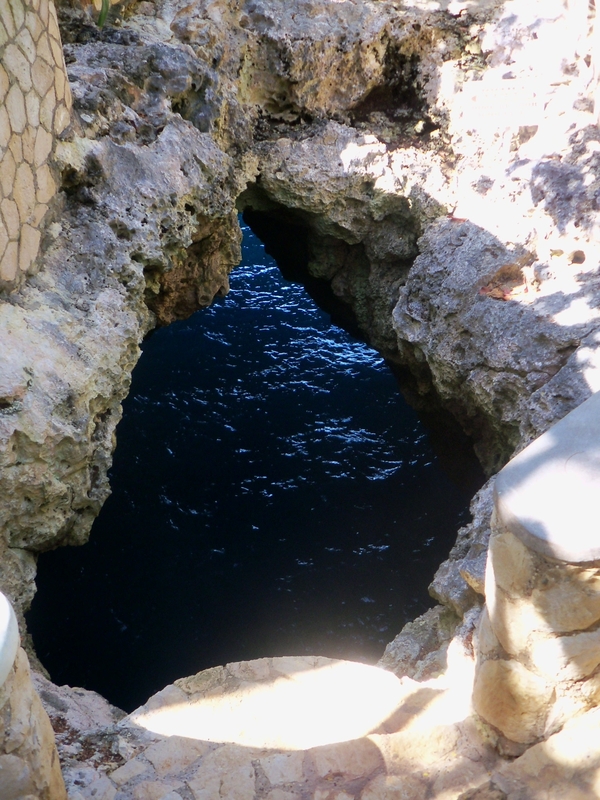 A visit to The Caves resort was one of our highlights during the recent stay in Negril, Jamaica. 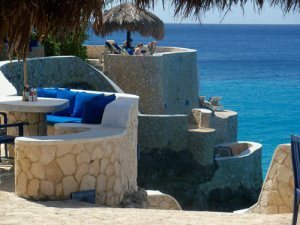 This unique gem is perched above and built into Negril’s steep cliff and cave side. A narrow road winds along the coast directing us to the resort, making it easy to miss the hidden entrance. A small light blue gate, just big enough for a mini-bus, is the only entrance at the resort, which is hidden behind walls. The driveway is so small that there is hardly enough space to turn your car. The lobby consists of a small, two-story building with a blue fenced in front porch; nothing fancy, just pure Jamaican country charm. It’s like arriving at a friend’s home. As we arrive, the hotel sales executive was the first to provide us with a warm Jamaican greeting. Filled with pride and excitement, he escorted us on a small winding path to show us the highlights of the property. The stone path leads us through beautiful gardens, which guide us to a few unique cottages. We then approache Macka Tree; right below is a giant carved-out bluehole where visitors can jump into, at their own risk. The bluehole directs the swimmer to a cave that soon approaches the wide open Caribbean Sea. As we move further, we walk towards the edge of the cliff that leads to a small spa. The spa is very discreet, but incredibly beautiful with remarkable service to satisfy your needs. Our tour continues by walking along the cliff’s edge again. We climb down a steep staircase towards the cave structures. Small terraces approach, and lead us to the first cave that invites guests to lounge and sunbathe while viewing the ocean below. Inside the cave it was so peaceful and secluded that it felt like the property was yours. The first cave was designed for guests to dine in private. At night, the inside of the cave fills your sight with beautiful candles and the sound of waves crashing below. The second cave is a Rum and Cigar bar; a unique feature to Negril, which again at night becomes lit with candles and small lights. The bar invites guests to lounge in relaxing benches and enjoy a large selection of different rums and cigars. A warm evening breeze sways through the cave as the peaceful sound of crashing waves encircle it. The last cave was also unique. A hot tub is built into the cave and opens up to the sea through a window. From there you can watch the sunset and toast a glass of champagne. The Caves Resort treats their guests as if they were family. It is the perfect place to relax and rejuvenate. Guests enjoy cooling off in the deep blue sea by either jumping or climbing down a ladder. An inviting small pool that is above sea level allows visitors to relax while overlooking the breathtaking view of the ocean. Guests enjoy participating in snorkeling and kayaking, a favorite pastime activity at the Caves. There is also a variety of food to choose from that is cooked to your liking. Feel free to check out the pictures we took during our visit! The Caves can be a wonderful option for a honeymoon, relaxing getaway, or a destination wedding.